This wasn’t happening. It had to be a dream. A horrible, cursed dream. I turned away from the window back to my three Shieldsworn, all bearing the full plate so rarely worn in their line of work, each one bearing a full tower shield. I couldn’t understand how they bore all that weight in addition to the heavy silence in the room, which was as much as I could bear. “I have no wish to be elsewhere when the Citadel falls,” I muttered, glancing back out to see the sea of invaders crashing against the wall below. And so we glided down the endless flight of stairs that served as an escape route of the Cloudreach Citadel. It probably hadn’t seen any use in centuries, as the dust in the air was so thick I could taste it. Berun stormed down the stairs ahead, his torch painting the old stones in a dark orange as we passed. Did they have to build these stairs so steep? One misstep could send you tumbling down for an hour. We spent the rest of the flight in the dark halls in silence. Through the stonework I could hear the distant cries of my beloved city falling to pieces. I could hear how close we were to the ground based on how far away the clamor was. I bit my lip. It would make me a target. I took it off and glared at it as it gleamed in the fire light. No time for disagreements now. My Shieldsworn were in their element here, and it would be foolish not to follow their lead. I stowed it in the pack to my side. Berun snuffed his torch, leaving it on the ground and shoving the door open. We emerged into a throng of chaos—what few guards were stationed here in the city held off the numerous invaders. Even outnumbered, they held the savages back with ease, cutting down foe after foe. They were endless, however, and well trained as they were, my men were losing ground. “This way,” Berun gestured. I followed close behind. The chaos was loud. Steel slammed against steel. Men shouted as they barked orders, or cried as they were cut down. 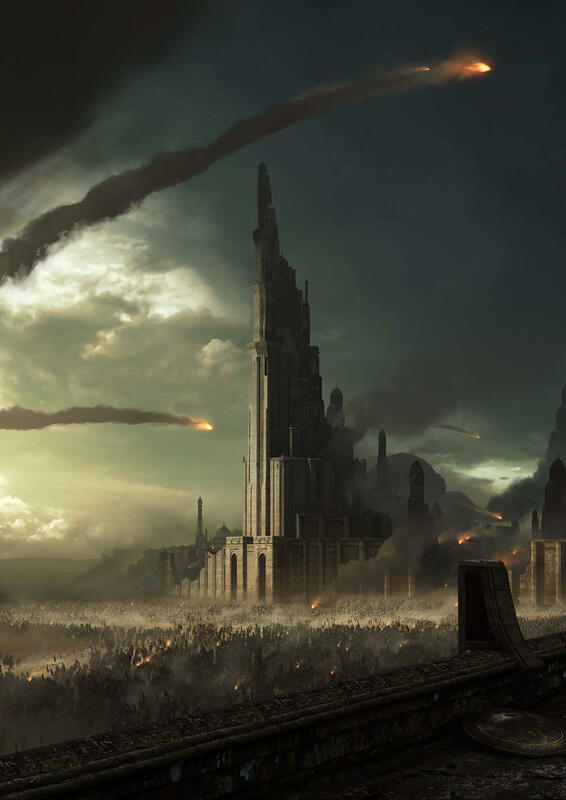 Horns blared, and flaming missiles soared through the sky as they bombarded the already crumbling wall. The sound of glass breaking accompanied these cries. I couldn’t place the origin, but it seemed to be coming from the invading soldiers. I watched as a guard cut down a couple armed only with farming sickles. They didn’t even wear proper armor. “Your Highness, keep up if you please,” Berun pressed, half turned as he watched both me and the path ahead. “Highness!” one of the other Shieldsworn shouted, shoving me to the ground as she moved herself in between me and something—or someone—I hadn’t noticed. The unexpected toss took more wind out of me than I would have guessed, and it took me a moment to get my bearings once more. As I made to get up, I noticed that my crown had been cast aside, apparently not as safe and secure as I thought. It now bore a dent on the side, but whether it was new or simply unnoticed I couldn’t say. Instinctively, I put it on as I stood to my feet. And watched in horror as my assailant—a young woman wielding no more than a small dagger, was kicked and beaten by two of my three fully armored Shieldsworn. “What is the meaning of this?” I scolded, pushing aside my escorts. They stopped with some hesitation. Evidently they deemed her no threat at this point, a broken and bloody mess as she was. “Whatever could you mean, Highness? She clearly meant you harm. This is a battle,” the Shieldsworn that had thrown me aside said. She scanned the perimeter as she did, not the least bit concerned. After a moment, her eyes focused on me, which seemed a great deal of effort on her part. “Easthaven,” she coughed. “Down with… the King…” she spat up at me, but she didn’t have the strength or energy, so a trickle of blood spilled out of her mouth as she lost consciousness. “CITIZENS OF CLOUDREACH!” a voice boomed from above. The clamor lessened slightly as the Shieldsworn and I looked up. To see the form of Commander Arturas standing on the lower balcony of the Cloudreach Citadel. I faced back to my Shieldsworn, who turned to me in kind. “Let’s go, Your Highness,” Berun said, with less urgency but more expectation that I would obey. Arturas kept shouting as the first signs of the ending strife showed. He spoke of new beginnings and the restoration of virtues. I removed my crown and thumbed the new dent, following my three Shieldsworn as we made to flee the city. But a question buried itself in my mind. Wouldn’t killing me have been easier than all this?